Psytronik Software is a commercial software label that was set up in 1993 by me (Kenz). 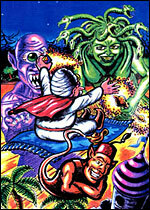 It was formed when C64 programming GENIUS Jon Wells was looking for a way to release his conversion of the Speccy budget game Sceptre of Bagdad (which we renamed 'Baghdad' to correct the dated spelling of the original). Jon originally produced the game for Atlantis software but they sunk (Hoho! Atlantis, sunk! See what I did there?) 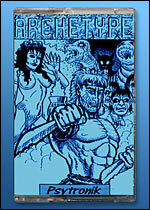 before the C64 version could be released so I offered to release the game for him and 'Psytronik Software' was born. I came up with the name 'Psytronik' by thinking I could combine the quality of Psygnosis (I loved the lavish packaging that came with their games) with the value for money ofMastertronic - although I changed the last 'c' to a 'k' as either a nod to my own nickname, or because it looked cool. At around this time I was in regular contact with Swedish SEUCK legend Alf Yngve who is also a great illustrator and Alf offered to produce artwork for the Psytronik games as well as providing some of his superb SEUCK games that were enhanced and then released on the Psytronik label. Despite our best intentions and a lot of hard work from myself, Jon Wells, Paul 'FeekZoid' Hannay, Alf Yngve, Jason 'TMR' Kelk & Phil Nicholson the Psytronik releases weren't huge commercial successes at the time. The C64's commercial software scene was in its twilight days when Psytronik was born, the off-the-shelf magazines were on their last legs and we had absolutely no budget whatsoever to work with for advertising or packaging (so much for my Psygnosis dream!) - I literally had to make do with scissors and a pritt-stick in order to create the tape inlays and disk-labels for the games. 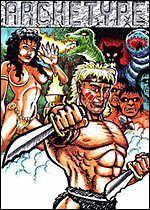 I also think people may have been put off by the later Psytronik games that were mainly enhanced SEUCK productions. 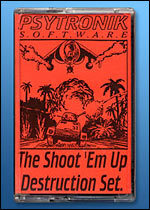 Despite the fact the SEUCK games were excellent in their own right AND featured enhanced front-ends and music etc. people still didn't want to pay budget prices for SEUCK games. Ah well! Looking back I'm very happy that we DID manage to get some games out there during the end of the C64's commercial era and I personally really enjoyed working with Jon, Alf, Paul, Jason & Phil on the Psytronik releases. Here's where it all started. 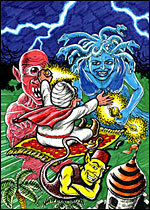 Sceptre of Baghdad went through many changes before we arrived at the final Psytronik version. Earlier versions of the game featured a main sprite based on the original Speccy character but was replaced with a more spritely (hehe!) 'Prince of Persia-esque' main character. 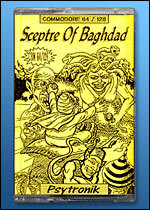 All in all, Sceptre of Baghdad was great first release - I just wish I could have done more with the packaging back then. The photocopied inlay was certainly 'nostalgic' - if only I had access to Photoshop and my glossy full colour printer back in 1993! Fortunately I was able to make up for this with the 2008 re-release version of the game which is now available in the Binary Zone Retro Store! pretty much everything from the original is included"
As an additional bonus my coding chum Phil Nicholson (aka Betrayer / Xentrix) enhanced Alfs hard-as-nails game 'COPS III: Cops, Robbers & Dinosaurs' with a nifty demo-style front-end along with funky music courtesy of Chris 'TLF' Lightfoot. I bundled COPS III with Archetype as a bit of extra value for money. 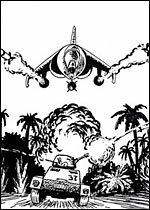 Unfortunately, the fact that both games were still SEUCK creations at heart - however good the enhancements, coupled with a moany review in Commodore Format, sadly affected sales. These two games became part of Jons 'SupportWare' scheme where people got the games for free and were asked to send a donation to the programmer if they liked them. Unfortunately, it would appear people liked the games but not the donating part - so that was the end of that. But still we soldiered on! Yep, there ARE Dinosaurs in Cops III! My lovely Commodore Zone magazine was in full swing at this point and as Jon was busy with his own Visualize and Supportware releases I recruited my CZone co-editor and coding chum Jason Kelk along with CZone tipster Warren 'Waz' Pilkington to help out with the third Psytronik release. 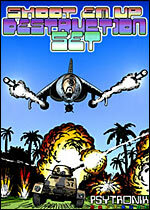 Alf was still churning out great games like Billy 'O so we decided to release a pack of FOUR enhanced SEUCK games this time. All great games - and very original too (especially Insectophobia) but it was a doomed commercial release thanks to the fact that once again the games were all SEUCK creations (the name of release probably didn't help!) Despite receiving a very favourable review in Commodore Format, only a handful of copies of this release were sold making the original tape version quite a rare little item now! While working on this webpage I produced a SEUDS logo (see above) based on Jason Kelk's design featured on the disk menu. I then got a bit carried away and decided to add a splash of colour to the original Alf Yngve artwork - and then added the new logo to the artwork along with the Psytronik logo. This new colour artwork was then used for the 2008 re-release of SEUDs which certainly was an improvementon the rubbish yellow inlay that adorned the 1994 release! "Slick & glossy presentation, detailed graphics with stunning animation, generous amounts of playability, imaginative"